We’d love your help. Let us know what’s wrong with this preview of Running the Amazon by Joe Kane. To ask other readers questions about Running the Amazon, please sign up. Running the Amazon is a thrilling personal account of a truly remarkable expedition, which traversed the entire 4,200 mile length of the powerful and mysterious Amazon river, of which the author Joe Kane was a participant. Starting from the source of the Amazon in Peruvian Andes a team of explorer’s - 10 men and a woman - travel through punishing terrain and dangerous jungles to finish a unique expedition – tracing the Amazon from it’s source to mouth was never recorded before – at Marajo Bay wh Running the Amazon is a thrilling personal account of a truly remarkable expedition, which traversed the entire 4,200 mile length of the powerful and mysterious Amazon river, of which the author Joe Kane was a participant. Starting from the source of the Amazon in Peruvian Andes a team of explorer’s - 10 men and a woman - travel through punishing terrain and dangerous jungles to finish a unique expedition – tracing the Amazon from it’s source to mouth was never recorded before – at Marajo Bay where Amazon meet Atlantic Ocean. Of the initial eleven members only four members – one of them is Joe Kane – made it to the mouth of the might river, with the other members dropping out at various phases, in an exhausting journey, which took six months to finish. The journey was a grueling test of human endurance as each step of the expedition had an aura of misery and doom written over it and there is enough adventure in the narrative to keep the reader glued to the book. Braving extreme weather, altitude sickness, malaria, murderous rapids, storms, jungles teeming with danger, narcotic traffickers, guerilla forces and native tribes the members of the expedition faces mortal danger on every phase of the journey. Problems with in the team and financial issues also add to the misery of the expedition. Joe Kane’ narrative is detailed and he is able to capture the spine-tingling thrills of such an extraordinary journey and the exotic environments of Amazon in a vibrant manner. The way in which the author narrates the kayaking part of the expedition through some of the most dangerous white waters on the planet is breath taking. A friend who knew that I had spent a month on the Amazon in a dugout canoe gave me Joe Kane’s book, ‘Running the Amazon’. It’s the story of the first expedition to travel from the source of the great river — 17,000 feet up in the Andes — to its mouth 4,200 miles away in Brazil. I began reading it with a huge dollop of skepticism. After all, I knew it wasn’t as romantic as it seemed. I had spent much of my time on the river swatting no-see-ums during the day, being devoured by mosquitoes at night A friend who knew that I had spent a month on the Amazon in a dugout canoe gave me Joe Kane’s book, ‘Running the Amazon’. It’s the story of the first expedition to travel from the source of the great river — 17,000 feet up in the Andes — to its mouth 4,200 miles away in Brazil. I began reading it with a huge dollop of skepticism. After all, I knew it wasn’t as romantic as it seemed. I had spent much of my time on the river swatting no-see-ums during the day, being devoured by mosquitoes at night, sometimes paddling for a full day in the blazing heat without seeing another human being, the river so wide at times you can barely see the other side. But I also knew that when you have a group of people bound together under difficult conditions, especially people with outsized egos, sparks can fly. The conditions for Kane and the nine others in the expedition he joined as its chronicler were difficult beyond imagination, far beyond my limited sea-level knowledge of the river. They had to battle oxygen deprivation at the top, rapids that roared through immense canyons on the way down, Peruvian revolutionaries who threatened to kill them, drug traffickers, unimaginable fatigue, the vagaries of nature, and most of all, their own emotions and those of each person on the expedition. The result: one of the most thrilling true adventure tales you can imagine. Joe Kane is a wonderful writer, and he had a unique cast of characters to write about. Imagine ten people with egos big enough to take a journey that no human being had ever taken before, one that would be dangerous at best and deadly at worst. This is the cast of characters that make ‘Running the Amazon’ such a magnificent tale. Kane, the only North American, is a newspaper reporter from San Francisco. Francois Odendaal, the South African expedition leader, is a man with grandiose plans and more than a few character flaws. Piotr Chmielinski, the Polish co-leader, proves to be a pillar of strength for a group that is torn by dissension before a third of the journey is completed. British doctor Kate Durrant, the only woman, provides medical support for the group. The others — Tim Biggs, Zbyszek Bzdak, Jack Jourgensen, Jerome Truran, Sergio Leon and Pierre Van Heerden — all have skills that should have made the expedition stronger. But egos clash and personal agendas get in the way. Only a handful would be around at the end of the six month journey. But they give us one helluva ride along the way. Clearly written by an excellent journalist this is a true story about Mr. Kane's expedition on the Amazon, from its source high in the Andes, to its end. His descriptions of the geography, topography and native cultures make it a memorable read, particularly to those interested in South American native culture. I felt predisposed to like “Running the Amazon” and, while it is a roaring read, came away mildly disappointed. Joe Kane was a journalist who found himself in the right time & place and made the best of it. Asked to join the first full navigation of the Amazon by kayak, despite his lack of river skills, he jumped at joining an expedition of international daredevils – who ended up fighting among themselves almost as much as they fought the river – as the only American. Due to his likable pers I felt predisposed to like “Running the Amazon” and, while it is a roaring read, came away mildly disappointed. Joe Kane was a journalist who found himself in the right time & place and made the best of it. Asked to join the first full navigation of the Amazon by kayak, despite his lack of river skills, he jumped at joining an expedition of international daredevils – who ended up fighting among themselves almost as much as they fought the river – as the only American. Due to his likable persistence, openness to learning, and siding with the winning clique, he ends being one of only four out of ten starters to actually accomplish the goal. In the process they overcome some of the world’s deadliest white-water, Shining Path guerrillas trying to kill them, inadequate funding and poor health, to be the first to run the Amazon’s full length. Nice. Yet the book has a claustrophobic feel, and not only from the massive upper river canyons of the Amazon’s furthest tributary, the Apurimac, in Peru. The infighting among the multinational egos – ranging from the Afrikaners who organized the romp, the exiled Poles who became the expedition’s core, a Tico and a Brit – takes more water under the bridge than you would think. The ex-patriot vibe, a bubble of an adventure floating down a river of cultural strangeness, barely diminishes as the months pass by. No natives were invited on the journey to help explain the sights, and instead only serve as picaresque encounters, some positive, many negative. The inherent drama of a bunch of loony foreigners, here going nearly blindly down a raging river, doesn’t need to feel this way. One of the classics of both travel literature and travel literature in Brazil, Peter Fleming’s 1933 “Brazilian Adventure,” deals with another batty quest (to discover the fate of one Colonel Fawcett who disappeared in the Amazon while searching for the Lost City of Z) enlivened by mutiny, came often to mind. While Fleming is as equally uninformed as Kane on the cultures he visits, he delights in the company of some young Brazilian co-adventurers and carries us through with a wit that is both incisive and self-deprecating, making the yarn both hilarious and informative. Don’t get me wrong. Kane writes smoothly, even winningly. Having been sought out, at first, by the expedition to write press releases for fundraising, and, when he refused, was then offered to join the expedition as its scribe if he raised sufficient funds, he demonstrates a becoming humility. Yet a certain coarseness, of a Californian out of his element, plagues him. And this from a narrator who, earlier in the saga, had decided to cheat on his live-in girlfriend (part of the trip’s impetus is that his home situation “scared” him) with the insistent wife of one his Peruvian hosts, which proved fruitless as it was all a joke. Augmenting his obtuseness is the usual modish Leftiness. I find few things less attractive than a traveler who badmouths his country when out of it. (With, clearly, the exception of tyrannical regimes.) So Kane’s puerile reply to a Peruvian host, “‘And if you get a lot of American money down here,’ I said, ‘Alan [Garcia] will not be President for long,’” grated. (Garcia was a leftist President in the late ‘80's whose term was “generally considered disastrous,” and “was marked by a severe economic crisis, social unrest and violence,” per Wikipedia.) When a menacing local revolutionary threatens him, Kane in a smug way relates how his reply to the query “What do you think of Alan?” with “He is intelligent and brave” earns him his freedom. So unblinking Leftism protects you from bad things even in Peru! Furthermore, while it is understandable that Kane had no time before the trip to research the geographies they would pass through, that he didn’t afterwards is less so. “A dozen bare-chested Indians waited our landfall there. (Yaguas, I believe, though the difference between the mestizo and Indian, let alone Indian and Indian, blur so much from that point on down the river as to be meaningless. )” Now I don’t blame a man for getting confused by the melting cauldron that is Peru and especially Brazil, but the comment neatly sums up the journey: the trip is about the winning, the proving themselves along a long race, and not about learning about the people who blur by in the river’s murky reflection. Remember, though, that Kane is a journalist, not a writer, so the reader’s expectations should adjust accordingly. (He boasts of writing for The New Yorker, which these days is not such a boon due to its political slant.) As if to compensate for this cultural blur, and to his credit, Kane’s one subsequent book called “Savages” is about an Ecuadorian tribe he spent months studying. And his dislike of American success is softened at book’s end when in a hotel’s sauna “for no reason other than homesickness, a Frank Sinatra song piped over the loudspeaker reduced me to tears.” I gladly cheered him on here. Indeed, the book’s finest moment comes quickly. “But there is no question of quitting now. Tomorrow, as I have for months, I will simply plow along behind my good friend Piotr Chmielinski.” If only Kane could have demonstrated such becoming humbleness towards a power greater than himself other than friendship, what a better book it might have been. On the whole, this book is a disappointment. The sub-title describes the voyage: "A firsthand account of the only expedition ever to travel the entire 4,200 mile Amazon from its source high in the Andes to its union with the Atlantic Ocean." It was the sort of trip that was "first" only because there's no real reason to make it. The course of the river down from the high Andes is rough enough that no traveler ever would take it solely for the purpose of getting from one place to another, and it On the whole, this book is a disappointment. The sub-title describes the voyage: "A firsthand account of the only expedition ever to travel the entire 4,200 mile Amazon from its source high in the Andes to its union with the Atlantic Ocean." It was the sort of trip that was "first" only because there's no real reason to make it. The course of the river down from the high Andes is rough enough that no traveler ever would take it solely for the purpose of getting from one place to another, and it probably wasn't even possible to follow it until the advent of modern equipment. Then, when the river slows down, it presents a journey of over 3,000 miles on flat water that probably would bore most white-water kayakers. Still, I expected the book to offer insight and observations on the people and plant and animal life of what still was a relatively untouched area. This expectation was not met; the members of the expedition come off more as squabbling tourists than skillful adventure travelers, the descriptions of people living along the river are mundane, and the author is not especially observant of natural history. The book also focuses entirely on the author's own observations and completely ignores what the rest of the group was doing during the frequent occasions when the party was forced to split up. Perhaps this narrow focus was used because the author wanted to tell only his own personal story, or perhaps other members of the expedition chose not to cooperate, as it is evident from fairly early on that they had split into cliques and didn't care much for each other. In any event, the story is left incomplete. I hard a hard time getting into this then really loved it. I think at first I was just trying so hard to keep up with which parts of the group were going where and rendezvousing when and so forth that it was kind of distracting but when the author gets on the water and goes the full length, well that was so awesome! I'm the kind of person who doesn't wonder "who wants to do that?" and instead wonders "who doesn't want to do that?" If there were a literary canon of river exploration this book would be near the top of the list. Great read about an important and historic descent. Loved it. This book is constantly on the recommended reading lists for those interested in canoe/kayak expeditions and adventure travel in general. The author is invited to document the first ever attempt to kayak the entire Amazon from the headwaters somewhere in the mountains of Peru through the Amazonian jungle and finally to the sea. The majority of the book takes place in Peru. In fact they don't actually reach the Amazon proper until about 75% through the book. And that's because to actually start f This book is constantly on the recommended reading lists for those interested in canoe/kayak expeditions and adventure travel in general. After 730.70 kilometres (454.04 mi), the Apurímac joins the Mantaro River and becomes the Ene River at 12°15′46″S 73°58′44″W, 440 m (1,440 ft) above sea level; then after joining the Perené River at 330 m (1,080 ft) above sea level, it becomes the Tambo River; when it joins the Urubamba at 280 m (920 ft) above sea level the river becomes the Ucayali, which is the main headstream of the Amazon. The Apurimac river is essentially one long Class V (or VI) rapid through a narrow canyon. Kane's description of running this particular river is worth the read alone. It is the kind of edge of your seat adventure writing that is great for armchair explorers. In addition to running the river the group has to deal with insects, hostile (sometimes surprisingly so) natives, lack of food, Communist Guerrillas (this took place in the 80's at the height of the Shining Path insurgency) and trigger happy border guards. And, most significantly, the dynamics of the group which were complex at best and led to a significant lack of group cohesion through a large part of the trip (often threatening to end the whole trip prematurely). Here's a tip: getting asked to join an expedition to somewhere far-flung and dangerous?? Check the references of the other group members - especially the leaders. It might save you some nasty surprises when you are in the middle of nowhere. Running the Amazon by Joe Kane is about a voyage that began in the Peruvian Andes. It continued down rapids so fierce they could swallow a raft in a split second. It took 6 months and was 4,200 miles long. It ended where the Amazon River runs into the Atlantic. This is Joe Kane’s personal account of the first expedition to travel the entirety of the world’s longest river. It is an adventure filled with death-defying encounters. I would recommend this book to people who are interested in adventur Running the Amazon by Joe Kane is about a voyage that began in the Peruvian Andes. It continued down rapids so fierce they could swallow a raft in a split second. It took 6 months and was 4,200 miles long. It ended where the Amazon River runs into the Atlantic. This is Joe Kane’s personal account of the first expedition to travel the entirety of the world’s longest river. It is an adventure filled with death-defying encounters. I would recommend this book to people who are interested in adventure. I liked how the story was told and was an interesting read even if you are not into whitewater adventure. Joe Kane did a good job of describing the canyons, forest, and local people. He was able to tie them into the Amazon’s history very well. Reading the foreign names were somewhat difficult to pronounce for myself internally as I was reading. After I got through that the book was amazing. Interesting book. Author was not someone who was up to this treacherous journey, nor was one of the men leading the expedition. Several of the members of the expedition dropped out and only two of them completed the journey. Classic. If you love true-life adventure, this book will do it. The author, Joe Kane, took me on an exciting adventure that thankfully I was able to enjoy from the comfort of my easy chair. An interesting account of a trip down the entire Amazon drainage. What I found more interesting was a look at a Peru from several decades ago. Enjoyable travel read detailing the first source-to-sea expedition of the Amazon River. Kane's style is vivid, descriptive, and accessible, like an edition of Outside that doesn't stop before the read wants. Recommended for anyone who enjoys travel and adventure writing, and anyone who has spent time in the Peruvian/Bolivian highlands and wants to take a literary journey back. Also a good read for anyone interested in South American history, Peruvian history, the Incas, '80s guerrilla and narco Enjoyable travel read detailing the first source-to-sea expedition of the Amazon River. Kane's style is vivid, descriptive, and accessible, like an edition of Outside that doesn't stop before the read wants. Recommended for anyone who enjoys travel and adventure writing, and anyone who has spent time in the Peruvian/Bolivian highlands and wants to take a literary journey back. Also a good read for anyone interested in South American history, Peruvian history, the Incas, '80s guerrilla and narco movements. The daily death-defying episodes combined with the supercharged interpersonal, multi-national drama among expedition members reads like the literary version of Survivor, about 20 years before Survivor's time. Four stars for the approximate 100 pages that span the middle third of the book, which awesomely put the reader at the scene, in the scene, of white-knuckle, near-fatal whitewater episodes, dramatic encounters with the Shining Path, dealings with isolated locals operating on their own sense of morality and justice, and the insane weather and geography of the Andes. I liked this book for its well-crafted descriptions. I liked it better yet for its insights into what can go right -- and wrong -- in an adventure team. But i loved it for its closing words, which said something I've tried to put into words most of my life, just exactly right: "Without a doubt, running the Amazon was the looniest thing I've ever done. That I survived was a matter of luck as much as anything else. I felt relieved when we finished and was happy to get home. I own a house and a car I liked this book for its well-crafted descriptions. I liked it better yet for its insights into what can go right -- and wrong -- in an adventure team. But i loved it for its closing words, which said something I've tried to put into words most of my life, just exactly right: "Without a doubt, running the Amazon was the looniest thing I've ever done. That I survived was a matter of luck as much as anything else. I felt relieved when we finished and was happy to get home. I own a house and a car. I like books, movies, good food, cold beer. In short, I enjoy the distractions of modern life, and I'm thankful to be in a culture that readily provides them. But the Amazon taught me something about the true cost of such comfort: Basically, it's insulation. Direct experience is our best teacher, but it is exactly what we are most bent on obliterating, because it is so often painful. We grow more comfortable at the price of knowing the world, and therefor ourselves." This was a gripping tale - full of adventure sans embellishment. I met Joe soon after his adventure and discussed RAN and other conservation issues. Being a flat-water marathon kayaker I was particularly intrigued with the whole trip and measuring of the Amazon (except for Tim Biggs' maniacal whitewater excursions.) The Biggs brothers are an iconic legend in the kayak world as well as Danny's Comrades Marathon prowess back in my homeland of KwaZulu-Natal. Everyone who I have referred this captiva This was a gripping tale - full of adventure sans embellishment. I met Joe soon after his adventure and discussed RAN and other conservation issues. Being a flat-water marathon kayaker I was particularly intrigued with the whole trip and measuring of the Amazon (except for Tim Biggs' maniacal whitewater excursions.) The Biggs brothers are an iconic legend in the kayak world as well as Danny's Comrades Marathon prowess back in my homeland of KwaZulu-Natal. Everyone who I have referred this captivating book to has thoroughly enjoyed it. Needless to say - the myopia of many who lead hum-drum lives of safety and security has been considerably corrected by the starkness of Joe's ability to put one right in the midst of adventure quests - of which Southern Africa is the unfettered home to. 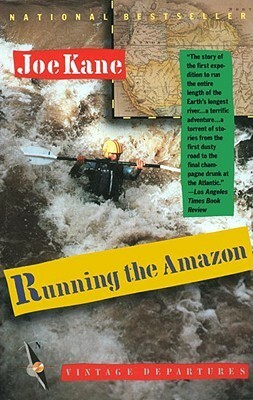 I am really late in writing this review, as I actually read "Running the Amazon" many years ago. For me the book was life changing, as it inspired me to have my own Amazon adventure, which led to even more adventures all over the world. Although enough time has passed that some of the details of Joe Kane's book have faded from memory. I do remember the story being one hell of a ride--and, of course, the guerrilla gunfire section was unforgettable. Joe Kane is a talented writer. It's too bad that I am really late in writing this review, as I actually read "Running the Amazon" many years ago. For me the book was life changing, as it inspired me to have my own Amazon adventure, which led to even more adventures all over the world. Although enough time has passed that some of the details of Joe Kane's book have faded from memory. I do remember the story being one hell of a ride--and, of course, the guerrilla gunfire section was unforgettable. Joe Kane is a talented writer. It's too bad that (at least for now) "Running the Amazon" and "Savages" are his only books. Perhaps it's time to reread his original classic! This true story is told in the first person by one who lived it--Joe Kane. Kane was recruited as a writer, to chronicle the expedition, but when other kayakers drop out (due to lack of skill, time constraints, and homesickness), he finds himself one of two paddling on to where the Amazon meets the Atlantic Ocean. Kane's writing style is brisk and funny. Once I got into the story of the adventure, I didn't want to stop reading. And funny--I laughed aloud many times throughout the book. Kane is a straightforward author, and he doesn't clutter this book with an inflated sense of style. His journalistic background shows as he manages to both detach himself from much of the drama and tension of a 12,000-mile voyage down the Amazon, as well as thrust himself into its center. Experiencing Kane as he grows into a role he never envisioned at the start of the trip makes him an endearing autobiographer, while his keen observations of the life both in the party and in villages scattered Kane is a straightforward author, and he doesn't clutter this book with an inflated sense of style. His journalistic background shows as he manages to both detach himself from much of the drama and tension of a 12,000-mile voyage down the Amazon, as well as thrust himself into its center. Experiencing Kane as he grows into a role he never envisioned at the start of the trip makes him an endearing autobiographer, while his keen observations of the life both in the party and in villages scattered along the river's course create a gritty portrait of the disconnect between what most people regard as "Amazonia" and the reality of the life that clings to it. It's a quick read, but the strange mix of characters and the meandering trek make for an entertaining evening or two for the pent-up outdoorsy crowd. I like books about paddling and this was a good addition. If you want to measure how tough you are,read this adventure and then ask yourself if you could endure what the expedition party endured. This is also the second adventure book I've read where group dynamics proved significant. Whether mountain climbing or running a dangerous river,you better be sure everyone involved is really compatible. My only criticism of the book is the author's failure to include an epilogue. I had several questions I like books about paddling and this was a good addition. If you want to measure how tough you are,read this adventure and then ask yourself if you could endure what the expedition party endured. This is also the second adventure book I've read where group dynamics proved significant. Whether mountain climbing or running a dangerous river,you better be sure everyone involved is really compatible. The story of the first source to sea trip written by a journalist. His descriptions of the journey and human interactions are excellent. *I learned about the Amazon from the bleak and frigid mountains, down rapids, through the jungle, finally out to the sea. *I learned about the people who live on the Amazon - the indigenous peoples, farmers, drug lords, village and big city dwellers. *I learned about leadership - how a true leader can rise without undermi Excellent adventure! Wonderful writing! *I learned about leadership - how a true leader can rise without undermining the self-appointed leader. “There is an inherent, humbling cruelty to learning how to run white water. In most other so-called "adrenaline" sports—skiing, surfing and rock climbing come to mind—one attains mastery, or the illusion of it, only after long apprenticeship, after enduring falls and tumbles, the fatigue of training previously unused muscles, the discipline of developing a new and initially awkward set of skills. Running white water is fundamentally different. With a little luck one is immediately able to travel long distances, often at great speeds, with only a rudimentary command of the sport's essential skills and about as much physical stamina as it takes to ride a bicycle downhill. At the beginning, at least, white-water adrenaline comes cheap. It's the river doing the work, of course, but like a teenager with a hot car, one forgets what the true power source is. Arrogance reigns. The river seems all smoke and mirrors, lots of bark (you hear it chortling away beneath you, crunching boulders), but not much bite. You think: Let's get on with it! Let's run this damn river! And then maybe the raft hits a drop in the river— say, a short, hidden waterfall. Or maybe a wave reaches up and flicks the boat on its side as easily as a horse swatting flies with its tail. Maybe you're thrown suddenly into the center of the raft, and the floor bounces back and punts you overboard. Maybe you just fall right off the side of the raft so fast you don't realize what's happening. It doesn't matter. The results are the same. The world goes dark. The river— the word hardly does justice to the churning mess enveloping you— the river tumbles you like so much laundry. It punches the air from your lungs. You're helpless. Swimming is a joke. You know for a fact that you are drowning. For the first time you understand the strength of the insouciant monster that has swallowed you. Maybe you travel a hundred feet before you surface (the current is moving that fast). And another hundred feet—just short of a truly fearsome plunge, one that will surely kill you— before you see the rescue lines. You're hauled to shore wearing a sheepish grin and a look in your eye that is equal parts confusion, respect, and raw fear.